At precisely 9.44pm on a hot and humid July 30th 1990, Georgia Mills took her first lungfuls of air in a maternity suite at St George’s Hospital, south London. Over the course of that busy weekend I made frequent trips to and from the hospital, was on the phone virtually non-stop and generally performed lots of new-dad duties. I also found time to do something a bit unusual. I taped the day’s news onto the VHS recorder and gathered up a selection of Saturday’s newspapers. Then I stuffed them all into a thick black plastic bag, the kind photographers keep light-sensitive paper in, stuck a label on it saying ‘Do not open until 31st July 2011’, and hauled it up into the loft. Fast forward to last Saturday evening and I’m in the garden with Georgia, her mum and younger sister. It’s Georgia’s 21st birthday and we’re drinking champagne while she opens cards and presents. Eventually she gets to the black bag and we all have a chance to peruse the contents. There’s a Guardian, a Daily Star, a Daily Telegraph, an Express, Mirror and Sun. There’s also the VHS cassette and – I’d forgotten about this touch – all the congratulatory cards we’d received from friends, relatives and neighbours. Had Georgia been born a few hours later the papers would have been of greater historical significance as they would have been full of Iraq’s invasion of Kuwait, which kicked off the first Gulf War. As it was, the two parties were still having talks in Saudi Arabia aimed as resolving their crisis. This news occupied one column inch in the broadsheets (my, were they broad). 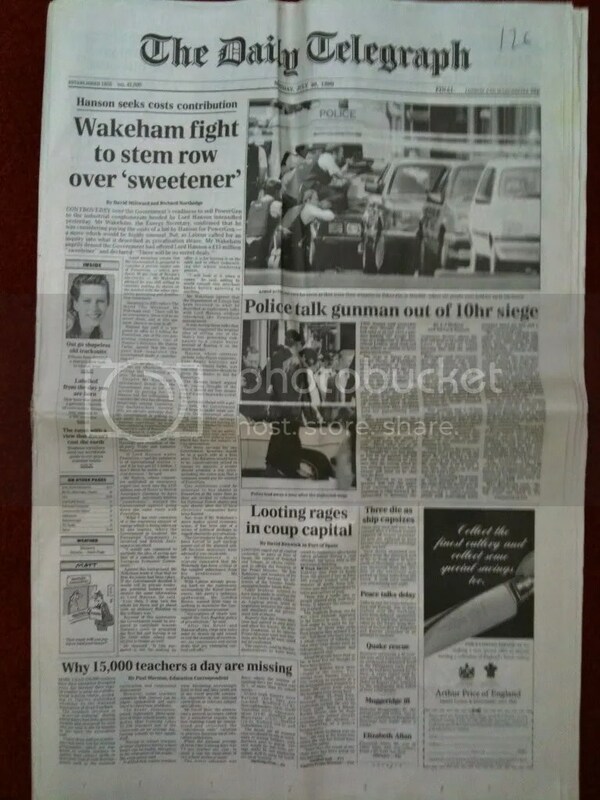 The main news in most of the papers was the peaceful resolution of a siege in London’s ‘Tokyo Joe’ nightclub, although the Guardian went for ‘Trinidad gripped by chaos’. I’m interested in this sort of stuff from a historical perspective. 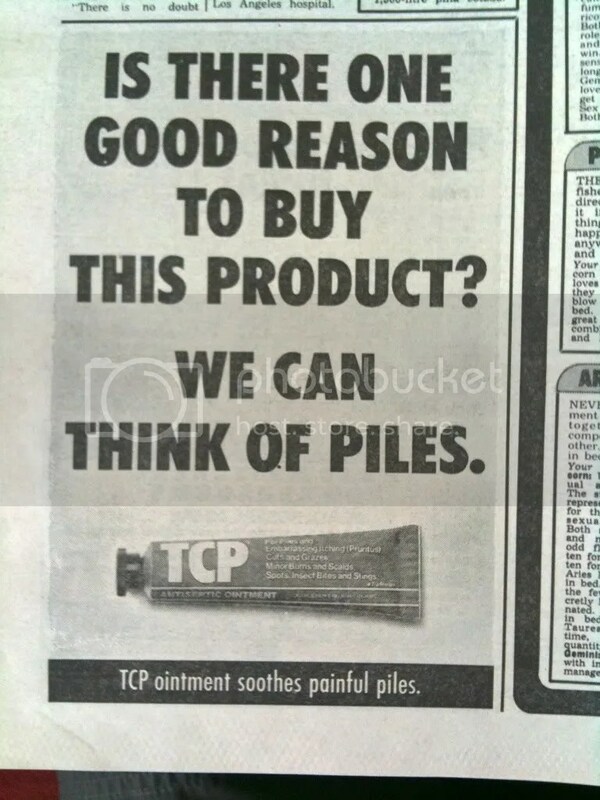 I especially enjoy reading the adverts. They’re a window into a world that can be strangely reassuring and utterly alien. Here’s a small selection, together with the front page of the Telegraph. As a radio news bulletin, the front page alone would occupy more than 20 minutes of airtime. Retro's nothing new, you know. 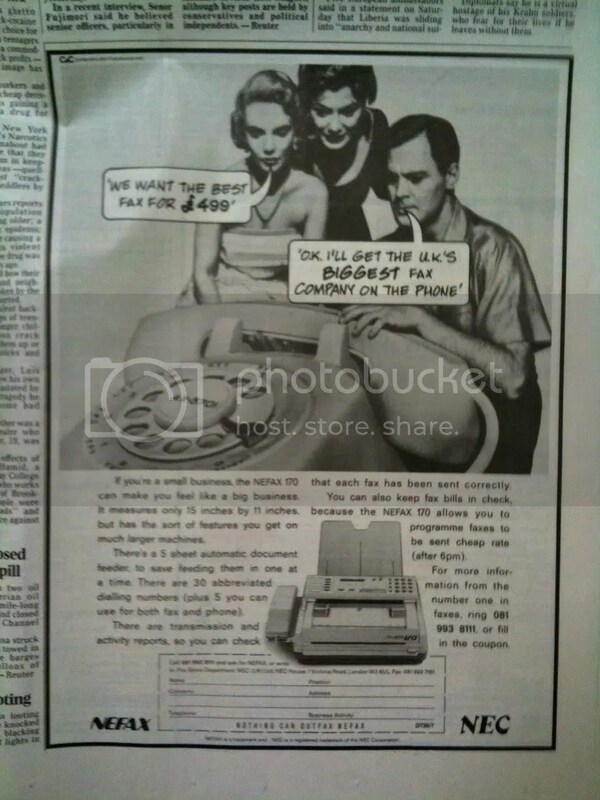 Here's a retro ad for a fax machine, which is pleasingly ironic. A rare colour ad. 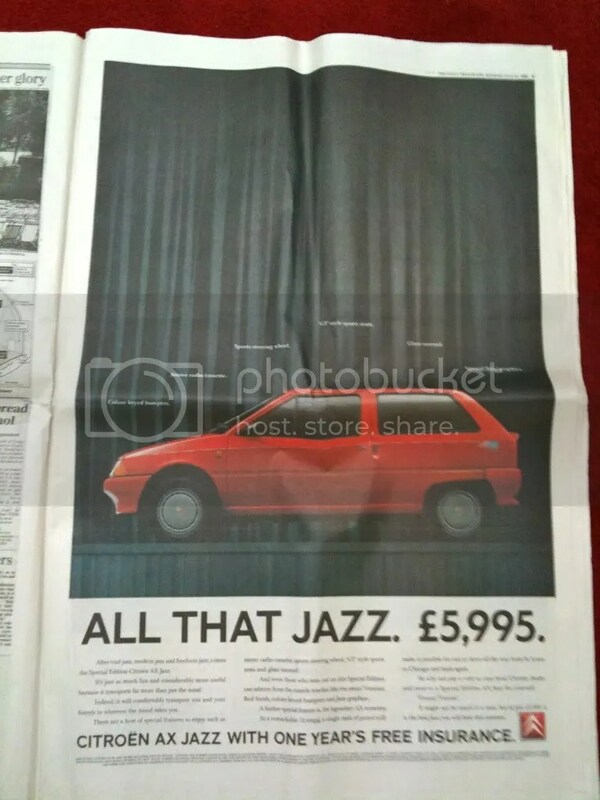 For £5,995 you got a stereo radio/cassette and 'special 'jazz' graphics'. After 21 years, this is still very recognisably an ad for First Direct. 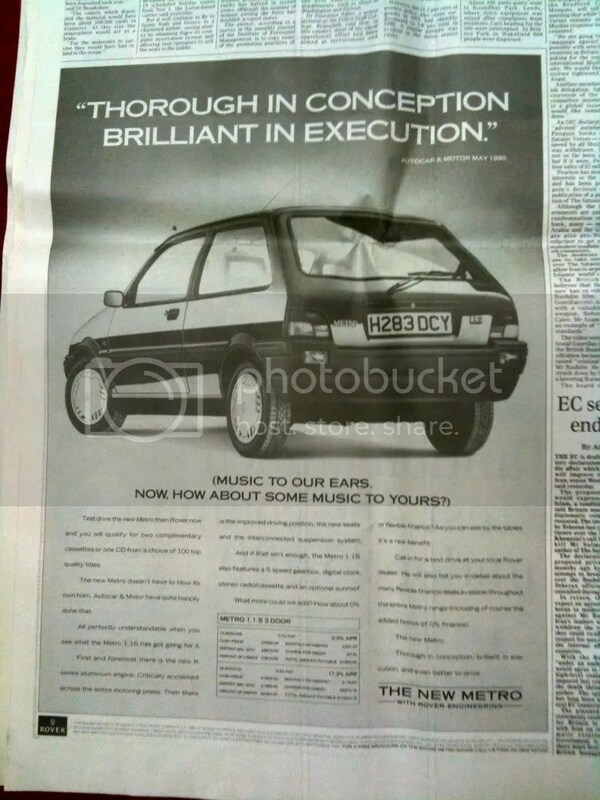 Whatever happened to Metro? Or Rover? Or the team responsible for this confection? 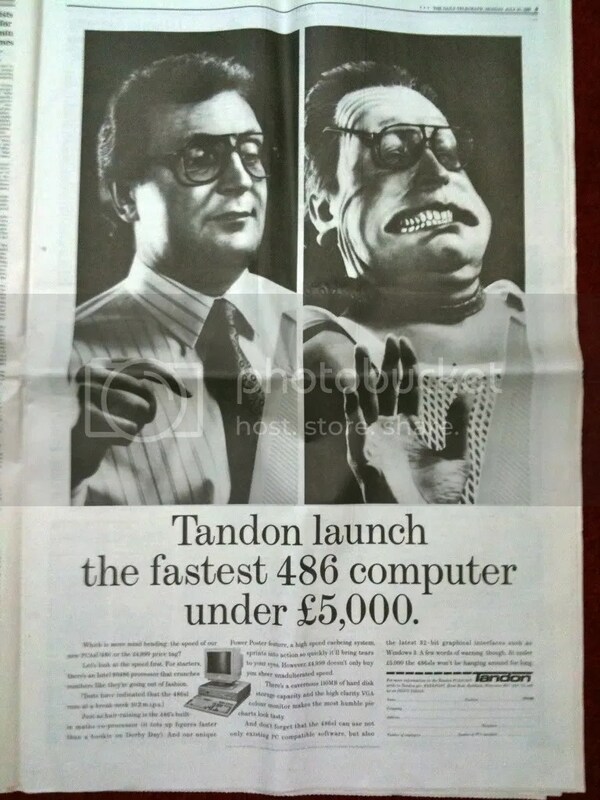 Finally, an ad from 1990 that you could easily run today without changing much.